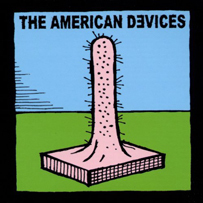 Originally released in 2005 on the now defunct Grenadine Records label, this is a greatest hits CD by The American Devices, a lo-fi freak punk group from the first wave Montreal 1978 punk scene led by noted underground cartoonist and film-maker, Rick Trembles. The band have been recording and playing continuously under the radar for over 32 years. This CD comes with a detailed 12 page booklet plus a bonus mini-poster with a meticulous Montreal punk family tree that's become an important guide for collectors internationally. Guitarist/Vocalist Rick Trembles is best known for his Motion Picture Purgatory comic strips & books and perhaps the highest praise possible by Robert Crumb who noted that Rick is "even more twisted and weird than me." These legendary no-wave forefathers first saw the light with the meeting of Montreal south-shore teens Rick Trembles and Rob Labelle, who in the 70s were mainly absorbed in the middling pre-punk counterculture of the day & all its trappings. Building on a burgeoning canon of early punk influences such as The Germs, The Contortions, & The Buzzcocks, Labelle and Trembles broke out of that stifling environment with respective groups The Normals (one of Montreal's very first punk bands, circa 1977) and The Electric Vomit. Trembles and Labelle would form the American Devices in 1980, expanding musically while remaining rooted in punk & no-wave as well as their enthusiasm for the likes of Captain Beefheart, Jimi Hendrix & bubblegum music. This compilation, at the time, was a 25 year retrospective tracing the development of The American Devices with the help of extensive liner notes by Rick Trembles delineating the history of a group whose membership has included the likes of Dave Hill (Men Without Hats, Three O'clock Train), Chris Burns (Terminal Sunglasses, Crackpot) and Jackie Gallant (Lesbians On Ecstasy) among many others. The group's current incarnation also includes drummer Howard Chackowicz and bassist Andre Asselin. Chackowicz plays a character based on himself for the acclaimed CBC radio show Wiretap (with Jonathan Goldstein) while Asselin boasts an equally long list of musical collaborations in experimental rock & jazz (Sam Shalabi, Nutsak, Swamp Circuit). The American Devices are still active and playing live and ready to be re-discovered (yet again).